Quick, can you name three starters on the Colts defense? If you can’t, well, that’s precisely the reason why I’m writing this article. The job Matt Eberflus has done with Indianapolis’ defense this season has largely flown under the radar because they’re still a fringe top-10 unit. But when compared to expectations, it can be argued that no unit in the entire NFL has outperformed expectations as much. The Colts are fresh off a shutout of the Cowboys this past week – one of only five shutouts in the NFL this season. While we can debate the merits of how impressive that is given Dallas’ offense this season, what is impressive is that the combined cap hit of the Colts’ starters in the game is over $15 million less than what the Cowboys pay their offensive line. At a shade over $25 million for the Colts’ defensive starters, they have nearly the same cap hit as Andrew Luck alone ($24.4 million). Yet, even with that mix of young players and castoffs, the Colts defense is eighth in the NFL in terms of points per drive at 1.84. How have they done it? It’s been a combination of talent recognition by General Manager Chris Ballard and a masterclass in coordinating from Matt Eberflus. The former is obvious, in players like rookie second-round pick Darius Leonard, who’s currently the fifth-highest graded linebacker in the NFL and a strong possibility for rookie of the year. The latter isn’t quite as evident from a highlight reel. One of the core tenets of a good coach is adjusting their scheme to the talent on the roster, and not forcing talent into their scheme. An objective look at the Colts’ roster would tell you that they should not have a good pass defense with their corners. Their number one corner, Pierre Desir, has already been waived by three NFL teams since being drafted in 2014. Opposite Desir is Kenny Moore II, who was an undrafted free agent out of Valdosta State last season and played all of 382 snaps as a rookie. Instead of letting each take their lumps against top wideouts, Eberflus has eschewed man coverage altogether this season. Indianapolis has lined up in man coverage on just 13% of their passing snaps this season, the second-lowest percentage in the NFL. Instead, they’ve turned into the poster boys for the ‘bend but don’t break’ mantra. Opposing offenses are completing an absurd 71.0% of pass attempts against the Colts this year. Only the hapless defense of the Tampa Bay Buccaneers has been worse. All of this, though, is by design. If you’re an opposing quarterback traveling to Lucas Oil Fieldhouse, chances are this is what you’ll see when you line up behind center. The big secret to the league’s most overachieving defense? 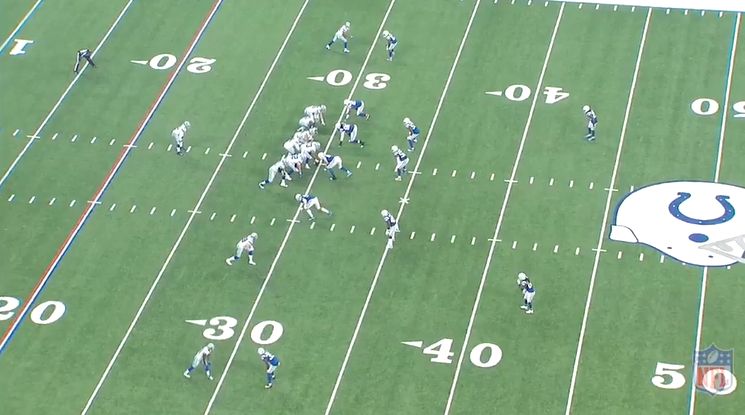 They run arguably the simplest scheme in the NFL. However, the simplicity only applies to the defensive side of the ball. With the static look, opposing quarterbacks can’t get any sort of presnap read on the defense and the route concepts that beat cover-3 don’t often overlap with the concepts that beat cover-2. It’s also a defense that can’t be ‘schemed’ into busted coverage. There are no complex rules about how to pass off crossing routes or how to alleviate the mass confusion that’s caused by presnap motion. Each defender drops to their spot and has the freedom to watch the quarterback’s eyes as well as the routes developing in front of them. They’re easy to define roles that the defenders have executed hundreds of times before. The result is a defense that plays as fast as anyone in the league. Whether it’s reacting to checkdowns or breaking on routes, the defenders are allowed to play off instinct rather than rules. It’s why Darius Leonard is second among all linebackers with 22 coverage stops, and why Kenny Moore is fourth among all corners with 17. 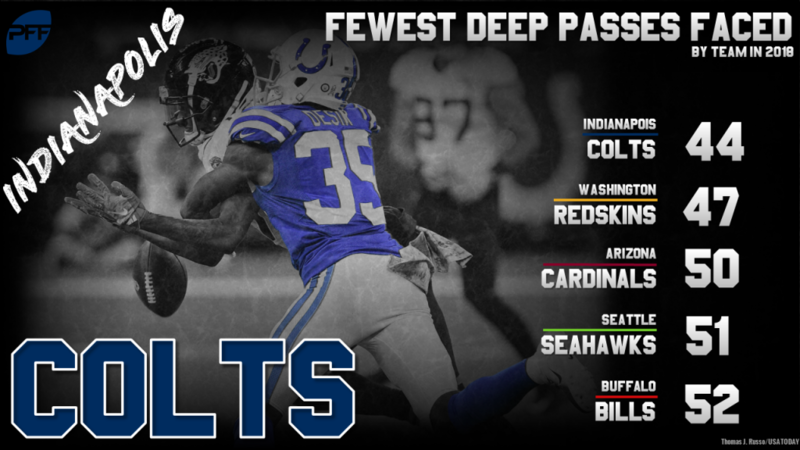 It’s why teams have only attempted 44 deep passes on them this season, the fewest in the NFL. With defensive coordinators losing sleep all over the league trying to keep up with everything modern offenses are throwing at them, Eberflus has shown that simplicity can be the best option.